Featuring 2 top UK musicians: The Hendrix Project takes you on a journey through Jimi Hendrix's legendary back catalogue. Enjoy the awesome music of 60s guitar legend Jimi Hendrix authentically recreated - with no detail missed - from 3 of the most talented musicians on the circuit today. Performing electrifying versions of songs from: Are You Experienced, Axis: Bold As Love, Electric Ladyland and Band of Gypsys, plus others made famous by Hendrix during his short but stellar career. Just like the original Jimi Hendrix Experience, The Hendrix Project is a 3 piece line-up and features UK musicians Phil Roberts (vocals, guitar) and Glen Child (drums), plus kiwi Steve Sussex (bass). 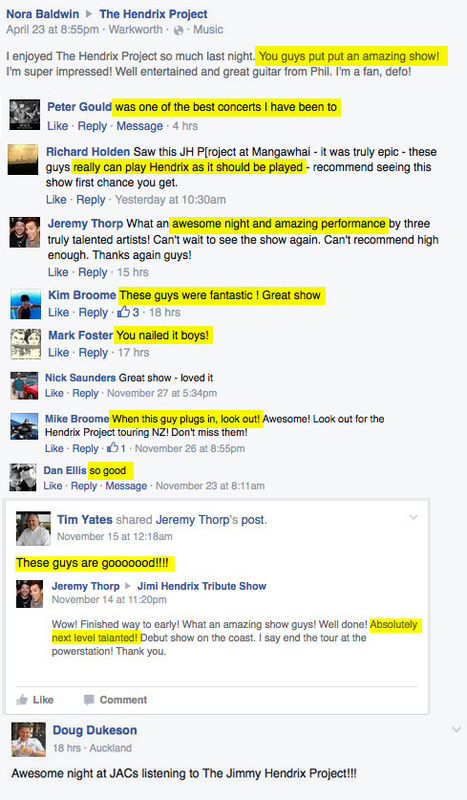 Don’t miss this incredible performance at one of the best venues north of Auckland.